Happy to hear my home ski area of Greek Peak is installing a new quad chair lift for the 2013-2014 season. The new owners are committed to improving the ski side of the resort and this first move is especially welcomed by this geezer skier. One of the banes of lift loading is having the chair whack you in the back of the legs. The new chair from Dopplmayr has a marvelous loading system. The skier slides onto a slow moving conveyor belt that is slightly slower than the chair speed so you are gently seated as the chair comes around behind you. With this system there is no human involved who could make a mistake in loading as it is with the standard fixed chair lifts. What a blessing!! Several standard lifts will remain in operation at the ski area so we geezers will still have to be alert to the distracted lift loader failing to hold the chair properly. However, I am impressed with the commitment of the new owners to improving the skiing experience. Perhaps there will be better training and supervision of the chair loaders. In spite of this comment about the loaders, I do want to thank them for their service. It is a tough job! Along with the new ski lift the new owners are purchasing a new groomer and upgrading the snow making. More pluses for the committed geezer skiers who are among the most regular everyday skiers. In addition new rental equipment is being purchased that should enhance the experience of the beginning skiers. Although we are just approaching summer, I look forward to the return of snow in December and enhanced facilities at the ski area. 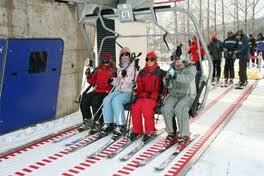 Another social plus for the new ski lift is the capacity of four on a chair allows more family togetherness. Now when daughter and son-in-law come from Long Island for ski weekend, we will all be able to ride up together.